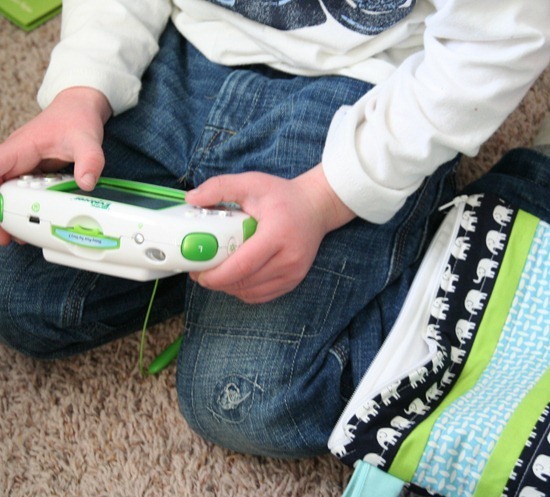 Ben got a Leapster for Christmas….and it needed some protection. I made this little box bottom zip pouch for it to fit in, with a big pocket on the outside for games and a nice thick handle he can carry it around in. 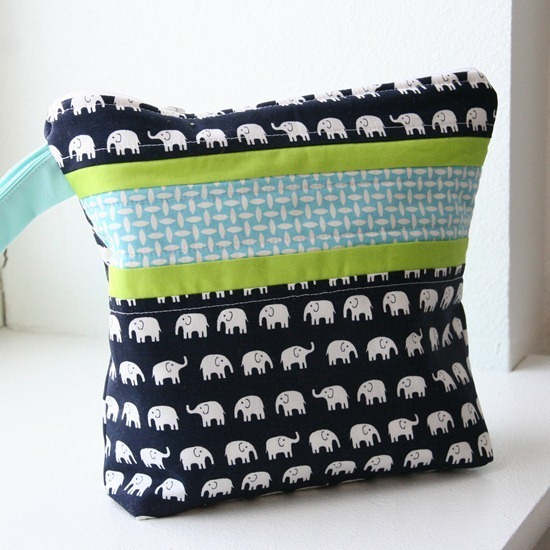 Anna has a good tutorial here, I just changed up the sizing a bit and added a pocket and a handle. 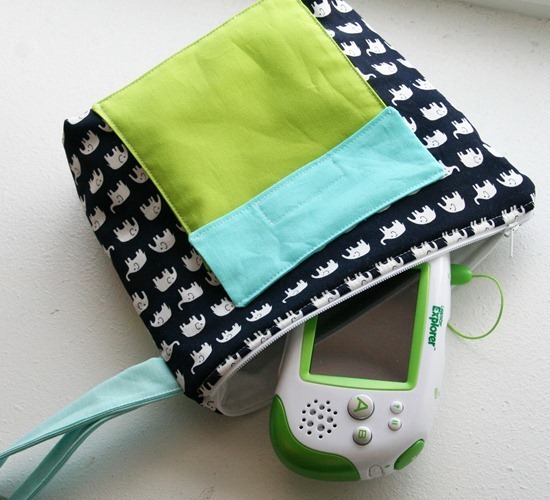 Maybe with a little luck this pouch will add some years to the Leapster’s life. Because (almost) 4 years olds and semi-expensive electronics don’t mix (cringe). I love it! My son also got a leapster for Christmas.. I just might have to make something like this for him. Thanks for the idea! i love this…and the fabric is so adorable. So good! I will be adding this to my things to do list for sure! Our three year old got a leapster as well for Christmas from Grandma, luckily she included the hardcover carrying zip case. I would have had to make this cute one otherwise. I'm sure I can think of something to store in a cute bag like this though. Boys are always carrying things around. Love the elephants, especially in black. Perfect for a boy. I have to make this… thank you! Oh this is so fun! I am totally making this for my ipod and cords with my new Prom fabric from Michael Miller! I love this! all of my favorite fabrics too! Oh good idea! My son has the hard case but I haven't seen one since to buy for my daughter. I should make her a bag. Looks great and i love the colours. This would work great for D.S as well. Great idea! Great idea! Love the fabric design. i LOVE this!!! My son just got a leapster for his b-day yesterday! I SOO need to make one of these! Very cute, I love the fabric combination! It's lovely that he's still at the age where a 'homemade' cover is acceptable. My 20 year old son was less than impressed when I offered to crochet him an ipod cover LOL! Seriously though, that's a cool cover, love the fabric. Words have no ability to convey how happy I am to have found this post! It amazes me that I can wrack my brain for things to sew that will be functional for my home, and yet this has never crossed my mind. I think this might easily be one of the most useful things I make this year. Thanks for sharing! I love it! My lil guy has had a Leapster since his last birthday and I've been pondering how to keep it safe. I just sent Mom to the fabric store so I can make one of these. I'm adding a pocket for the cartridges.